A close ally of Jeremy Corbyn caused fury among fellow Labour MPs today by heaping praise on the hard-Left council that ran Liverpool in the 1980s. Shadow equalities minister Dawn Butler hailed the Militant-dominated authority which set an illegal budget in 1985 in protest at government cuts. The Brent MP praised the Militant council for standing up to Margaret Thatcher, saying it was 'better to break the law than break the poor'. 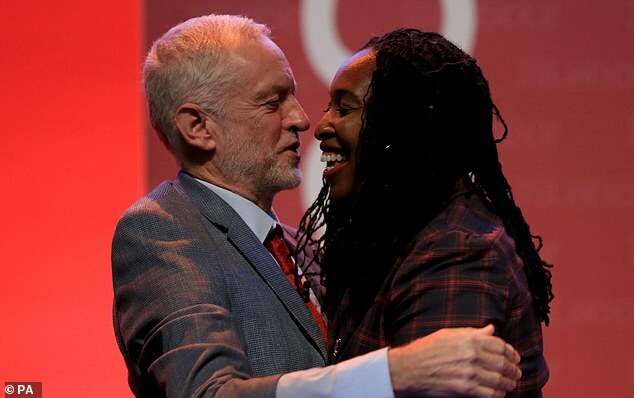 Her extraordinary endorsement, as Ms Butler kicked off the party's annual conference in the city, sparked outrage from party colleagues who said the remarks were 'another nail in Labour's coffin'. Speaking to Labour's Women's Conference in Liverpool, Ms Butler praised councillors who were fighting against cuts imposed by Theresa May's government. 'Local councils have seen nearly 50 per cent of their funding cut - I want to give a shout out to all the councillors fighting every day against these Tory cuts,' she said. Former leader Neil Kinnock's conference speech in 1985, when he denounced the Liverpool councillors, is seen as the turning point when moderates wrestled control from the union-controlled hard-Left. Kinnock told the party faithful that he would not tolerate the 'grotesque chaos of a Labour council - a Labour council - hiring taxis to scuttle round a city handing out redundancy notices to its own workers'.The Militant group's hold over parts of the party was broken soon afterwards, culminating in the expulsion of figures including Liverpool council's deputy leader Derek Hatton. However, since Mr Corbyn took charge of Labour in 2015 the Left has reasserted its power. 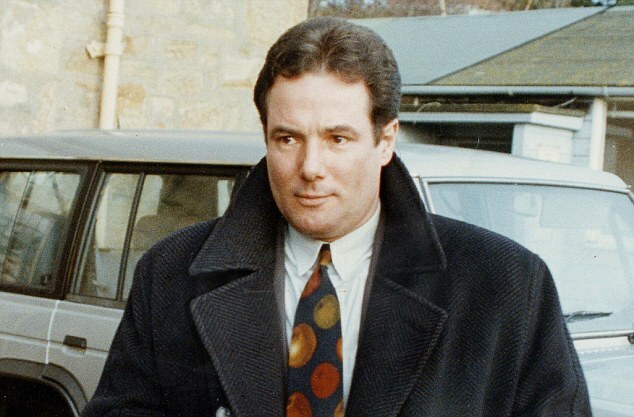 Former minister Chris Leslie told MailOnline that Ms Butler's remarks were 'astonishing'. John Woodcock MP, who recently quit the party in protest at its lurch to the Left, said: 'A current member of the Labour shadow cabinet praising the misery Militant brought to Liverpool. Conservative chairman Brandon Lewis said: 'This is the sorry state of Labour today: Shadow Cabinet members praising the hard-left militants of the 1980s. 'Militant controlled Liverpool of the 1980's boasted it was better to 'break the law, than break the poor' but ran out of money and was forced to sack its own workers. 'As Neil Kinnock said himself at the time: 'You can't play politics with people's jobs and people's homes and people's services. Labour peer Baroness Thornton slammed Ms Butler's praise for the rebel councillors in a series of tweets. 'Great to be at Women's conference, but am surprised that @DawnButlerBrent has just praised a Liverpool Council in the past - that of Derek Hatton - who issued redundancy notices to their own public sector employees, and failed to protect services too!' said Lady Thornton. Mr Corbyn and shadow chancellor John McDonnell wrote to all Labour council leaders in 2015 calling on them to resist calls to set illegal budgets. A Labour spokesman said: 'The point Dawn was making was that like the Thatcher government of the 1980s, this Tory Government has prioritised tax cuts for the rich while cutting services like women's refuges that save lives and keep women safe. The row overshadowed a speech by Jeremy Corbyn earlier on Saturday in which he said Labour could have more women than men in the House of Commons. Mr Corbyn said Labour was the 'party of women' and would measure the success of its policies by their impact on women. Labour had more female members than the Conservatives and Liberal Democratshad members at all, Mr Corbyn claimed. He also attacked Theresa May for her 'hostile environment' policy when she was Home Secretary, calling it 'disgusting and disgraceful'. Mr Corbyn said afternoon: 'We have a parity of women and men in the shadow cabinet and the next parliamentary Labour party when we've won a general election will in all probability have a majority of women MPs as members of it. 'The Tories may talk about equality, they may say their Government delivers for all, but the lived experience of women in Britain tells a different story. 'Labour is the party of equality, the party of women, the party committed to measuring all our policies on their impact on women in society. In 2017 there were 119 women elected as Labour MPs, just under half of the 262 seats the party won at the snap election. Mr Corbyn said companies who did not work to close the gender pay gap would be fined, in plans originally unveiled in March, and attacked the Conservatives for failing to tackle 'burning injustices' which Theresa May had spoken about.He said: 'The Tories' eight years of austerity is responsible for what the PM delicately calls burning injustices that she said she was going to tackle. 'But far from building an economy for everyone and helping the 'just about managing' this government has transferred cash from the purses of women into the bank accounts of the very richest men'. During his speech at the women's conference he said he would go to Brussels to visit a square named after Jo Cox, the Labour MP who was murdered by a far-right extremist in 2016. 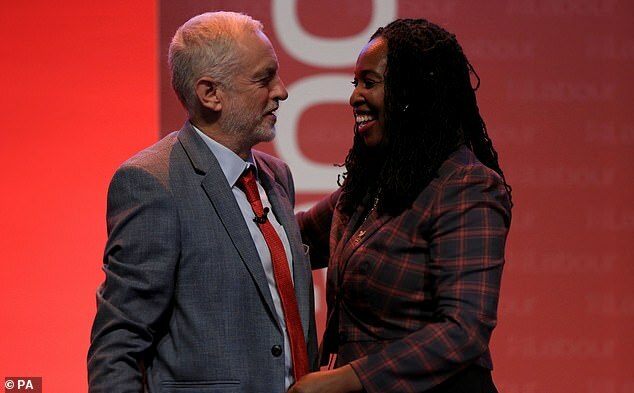 The party leader praised Labour MP Dawn Butler who unveiled plans to establish a stand-alone department for women and equalities with a minister at the Cabinet table in a future Labour government. 'The next Labour government will put equality centre stage,' Ms Butler said.